Hi it’s Adam Franklin and welcome to the 6th episode of Social Media TV where we’ll look at the standout events in social media. The first is that Facebook has now allowed you to actually set different Admin privileges, so everybody who looks after your Facebook Page can now either be a manager, an insight analyst, a moderator, an advertiser, or a content creator. So what this is good for is assigning different people in your organisation different tasks and responsibilities within your Facebook Page. Very Useful. Secondly, what Facebook is also allowing us to do is pre-schedule Facebook Status Updates. Now it hasn’t been rolled out across all Facebook accounts yet so just stay tuned – it might be in yours, it might not. What it allows you to do, is instead of just hitting that share button and your status update goes up right then, you actually schedule them from anytime from immediately to up to 6 months in the future, so it makes it a lot less time intensive than logging in every couple of hours to do a Facebook update or to do them through Hootsuite for example. But one thing to keep in mind when you are doing pre-scheduled Facebook updates or Twitter updates for that matter is, keep in mind that everything’s in real time and plans can change and things can wrong. 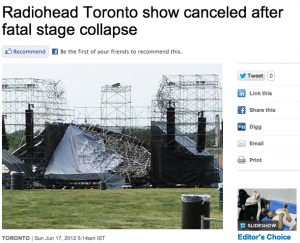 A story to highlight this is a tragedy that happened in Toronto at a Radiohead concert. The stage actually collapsed and at least one person died in the tragedy. The event organisers were really good, you know they sent a tweet advising fans that the concert had been cancelled which was really good but unfortunately they had a series of prescheduled tweets which they forgot to change. And so half an hour after announcing that someone had died in a stage collapse, they sent a tweet that said please take photos and share your Radiohead photos on Instagram using the #Radiohead hashtag. Of course this was highly insensitive. It wasn’t deliberate by them but the backlash from people on Twitter and people affected by the tragedy at the concert was totally understandable because they hadn’t actually gone back in and changed those prescheduled tweets. So if you are going to do it, yes, it can save you some time, but be aware of the consequences. Always be aware that social media operates in real time and go back in and change things as the situation changes. That’s a wrap for Social Media TV this week. My name is Adam Franklin. On Twitter it’s @Franklin_Adam. I’ll see you next time! Hat tip: Thanks to Scott Stratten from Unmarketing and Corey Eridon from Hubspot for bringing these social media news highlights to my attention via your blogs.